CSFR NYC announces campaign against the NYPD Strategic Response Group | Fight Back! 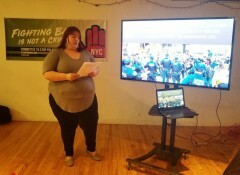 Committee to Stop FBI Repression - NYC meeting. Committee to Stop FBI Repression - NYC meeting. New York, NY – The Committee to Stop FBI Repression-NYC held its first general meeting, Sept. 10, at Project Reach, addressing political repression in New York after 9/11, leading up to the creation of the Strategic Response Group (SRG) within the New York Police Department. The purpose of the meeting was to educate attendees on political repression, and specifically the SRG’s role in promoting it. The various topics discussed included the history of the Committee to Stop FBI Repression’s (CSFR) work on cases such as the Anti-war 23, Carlos Montes, and Rasmea Odeh; the political atmosphere after 9/11; the creation of the Department of Homeland Security (which funds the SRG); the Bureau of Special Services (a defunct unit within the NYPD that infiltrated anti-war, Black liberation, and communist organizations in the 1960s and 70s, setting a precedent for NYPD repression of activists), and the SRG’s practices of targeting, using surveillance against, and arresting people at protests. The meeting ended with a list of demands and CSFR’s campaign statement against the Strategic Response Group, as seen below. CSFR will be having its next meeting on Tuesday, Sept. 18 at 6:30 p.m. to continue strategizing on how to disband the SRG. Visit their Facebook page (facebook.com/csfrny) for more information. If you are part of an organization that would like to sign on as an endorser of the campaign, please read the statement and follow the instructions below. The Committee to Stop FBI Repression NYC and the endorsing organizations call on the New York Police Department (NYPD) to stop deploying the Strategic Response Group (SRG) to protests. The SRG started developing in 2014 when Police Commissioner William Bratton determined that New York City needed a “special force” of rapid response police officers, and was formally introduced in 2015. By the end of 2015, the amount of officers within the SRG expanded to 800. The criteria for when the SRG can be deployed include cases of civil unrest, disorderly conduct, and large-scale terrorist attacks. In practice, SRG officers have targeted and arrested activists peacefully exercising their right to protest. They come equipped with military-grade weapons and surveillance tools to intimidate and threaten protesters. The SRG will also target known leaders of movements for arrest, especially people of color. The SRG’s purpose locally is connected to a larger system that represses activists and human rights. Along with receiving funding from the city, the SRG also receives funds from the Department of Homeland Security (DHS). The DHS was founded in response to the 9/11 attacks, repressing people’s rights in the name of counter-terrorism. Both treat those who speak out against war and human rights abuses as terrorists. It is the same system that invades sovereign nations and bombs countries abroad that wants to silence those who speak out against injustices in the U.S.
-- Stop targeting known activists and organizers. -- Stop using surveillance technology and military grade weapons, such as long range rifles, machine guns, and Sting Rays on protestors. Organizing is not terrorism and activism is not a crime. To get involved with the Committee to Stop FBI Repression’s campaign to Disband the SRG, contact us at facebook.com/csfrny or [email protected]. If you witness the SRG targeting and harassing people at events, record video and photos and send them to us. If your organization would like to endorse this campaign, sign on and share this statement.